​Arsenal have a long history of tough tacklers between Highbury and the Emirates Stadium, particularly during the 1990s and early 2000s. Before the Gunners became synonymous with small, creative midfielders as the Arsene Wenger era progressed, there were big, burly centre-backs and midfield destroyers who brought so much success to north London. The Arsenal of old's no-nonsense physicality endured some historic battles in the Premier League, notably against Manchester United, winning several titles and domestic trophies under George Graham and Wenger. While Gunners fans may currently be settling for Granit Xhaka and Lucas Torreira as the midfield enforces and Laurent Koscielny as the defensive brute, here's a reminder of Arsenal's catalogue of real hard men. Winterburn is widely regarded as one of Arsenal's greatest players for his steely mentality as well as his ability to drive up the wing, chipping in with his fair share of goals and assists. Standing at just five years at 5'8, unlike many on this list Winterburn wasn't particularly a physical powerhouse. However, the left-back was as fierce in the tackle as they came, as well as being tactically superb. After making the move across north London from ​Tottenham Hotspur in 2001, Campbell had it all to do win the hearts of Gunners fans but his hugely successful time at Highbury put everything to bed. Campbell was a monster at the back and the England international was a linchpin in Arsenal's 'invincible' 2003/04 Premier League campaign. Strong, imposing, powerful - Campbell is still the closest thing to Tony Adams the Gunners have seen. Midfielder Paul Davis played an integral part in Arsenal's success during the late 80s and early 90s, but it's one incident in particular which has earned him a spot in hard man folklore. During a match against Southampton in 1988, a Saints player was fouled near the touchline, winning a free-kick. Davis, 30 yards from the incident and seemingly unprovoked, swung a left-arm at Southampton midfielder Glenn Cockerill and broke his opponent's jaw. The promising Englishman was slapped with a nine-match man and a £3,000 fine. 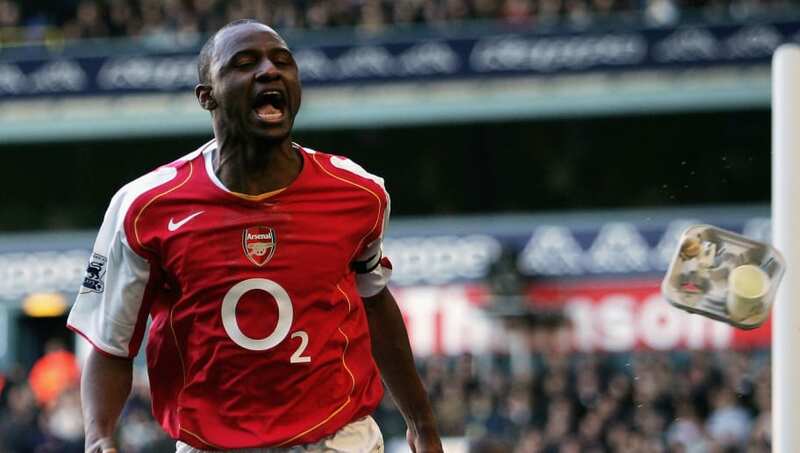 Vieira's personal long-term feud with Manchester United's Roy Keane is often remembered more than the games themselves, infamously coming to blows in the tunnel in 2005 after the Gunners captain squirted Keane with a water bottle after supposedly picking on Gary Neville. Arsenal have missed his steel and physical presence since his last day in north London 14 years ago, with United goalkeeper Peter Schmeichel claiming the great Gunners side of the early 2000s would have been "25% weaker" without Vieira. Averaging a yellow card every five league games, Bould's name is commonplace in discussions of the hardest men in the Premier League era. Wenger even brought the 6'4 brute into his coaching staff in 2012 as assistant manager, with the hope of instilling the defensive metal with which he was synonymous on the Arsenal pitch for 11 years, but it remains to be seen whether even Bould can toughen up Shkodran Mustafi and co. The centre-half holds the record for the second-most red cards in Premier League history for Arsenal and is arguably the hardest player of the Wenger era. One of the most memorable incidents involving Keown came during another clash with Man Utd at Old Trafford in 2003 when the Arsenal defender conceded a penalty. Ruud Van Nistelrooy missed the ensuing spot-kick, and just in case the Dutchman wasn't sure what had happened, Keown took it upon himself to celebrate wildly in front of his opponent with a forearm to the back of the head for good measure. It had been claimed that he regretted his reaction, to which Keown responded: "I never said that." Top of the list has to be Mr. Arsenal himself. Adams is immortal in Gunners' history (literally, he has a statue), with George Graham labelling him his "colossus" and Arsene Wenger giving him the title of "professor of defence". His footballing PhD could have been in any number of things - timing tackles, reading the game, appetite for battle, it goes on. The quintessential hard man made sure everyone knew what he was about in 1993, when teammate Steve Morrow scored the winner in the League Cup final against Sheffield Wednesday. Adams lifted the goalscorer into the air and dropped him without a care in the world, breaking Morrow's arm. You'd be hard pressed to think of a more determined, tougher and more iconic defender in not only Arsenal history, but in the Premier League era.